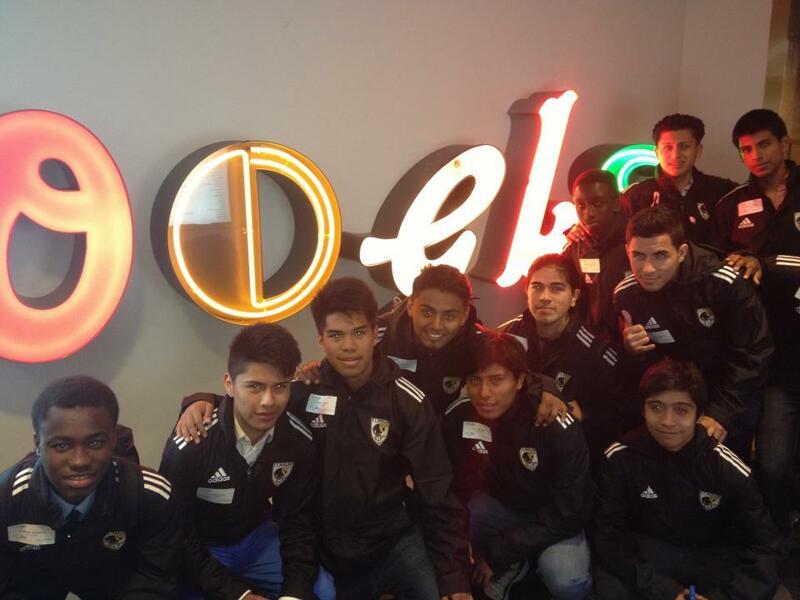 This past April members of the FC Harlem travel team were treated to an exciting, educational and eye opening visit to Google Corporate office in NYC. Tony Watkins, Googler ( term for employee of Google) and FC Harlem volunteer arranged the visit to what is considered one of the most desirable companies to work for. Tony and his Google colleagues took FC Harlem players and staff on a tour of the unique NYC offices and setup a Q& A session. In addition to being amazed by a cool interior design, googlers whizzing by on scooters and the gigantic game room, FC Harlem players had an opportunity to participate in an international video conference with googlers in Canada and got to see up close a pair of Google glasses. “The google glasses were amazing! !” said Armando Larios. U19 player John Estrada headed to Syracuse University in the Fall commented on how many of the staff he met that had English degrees. “I was thinking if you worked here you needed a degree in computer science, math and engineering which I am sure many do but the staff explained that they hire people with a wide range of backgrounds.” The players ended the tour with a photo next to the Google sign and a view of the city from the rooftop.